But she’s taking Journalism? Though Senior Shelsea Reynoso doesn’t want to be a journalist when she gets older, she actually doesn’t know what she wants to be, her love for Leyden influenced her to join the Journalism IV class this year. Whether she’s helping others sort through their problems in Peer Leaders or singing in the city with the choir, Shelsea enjoys being active member of the school in any way she can. 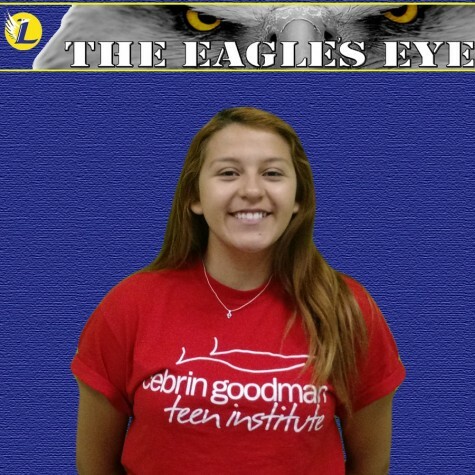 She hopes that her involvement with the Eagle’s Eye this year will help her spread the Leyden spirit she so proudly embodies. Nicholas Sparks strikes again: On a plane back from California, Shelsea was spotted crying while she read Nights in Rodanthe by infamous tear-jerker, Nicholas Sparks. However, Shelsea does not spend all her time reading love stories-she adores all books. Her interest was sparked when she began reading the YA author, Sarah Dessen. Now, some of her favorite books include the Fallen Too Far Trilogy by Abbi Glines and the Beautiful Disaster Trilogy by James McGuire. But she’s more up-to-date than you: Shelsea spent her senior summer in California, trekking through Los Angeles and DisneyLand, before returning the day after school started. Shelsea’s excited for her senior year, and to be a part of the Leyden paper where she hopes to become an even bigger part of Leyden, as she is already a part of Peer Leaders, Choir, Operation Snowball, and Orchesis.